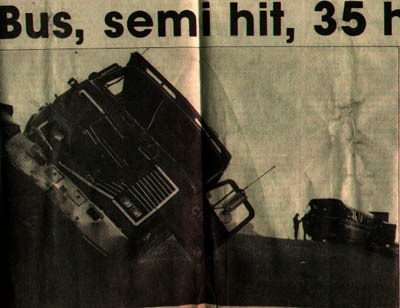 The summer of 1998 marked the 10th anniversary of the famed 1988 NA bus crash. In memory of that night, this page is primarily devoted to articles and memories of the incident. Soon to come, Melissa Buxton's tale. Also, take a look at the aftermath: photos of the destroyed bus. A semi-tractor trailor collided with a coach bus this morning injuring 34 on the bus and the driver of the truck. There were 34 people ages 13-21, on the bus, which was traveling from Mishawaka, Indiana to Saginaw, Michigan. Thirty five persons were taken to area hospitals this morning. Thirty-four were corps members and one was the semi-tractor driver. The bus driver was not injured. The accident occurred around 3-4 a.m.(Michigan time) on the I-80, I-90 toll road, two miles west of Howe-LaGrange exit. The semi-truck hit the bus from behind as they were both traveling east-bound. The bus was merging back into traffic at undetermined speed but slower than the limit according to Indiana State Police toll road officials at the scene. The bus was pushed several hundred yards along the right lane and shoulder. The group of teenagers and young adults are from the Northern Aurora Drum and Bugle Corps based out of Saginaw. They left Mishawaka about 3 a.m., and were on their way back to Saginaw after five days on the road in competitions. They were scheduled to perform in Saginaw, and perform for another two weeks. The injured were taken to either Sturgis, LaGrange, or Cameron Memorial (Angola) Hospitals. "Most got out on their own," said instructor Scott Heinrich, "everyone was conscious...a few broken arms, a few broken legs." Heinrich, along with about 20 staff members, was on the first of the three-bus convoy. The second bus was carrying another 30-35 children and young adults. The youth group also had one small truck carrying equipment. The staff bus and the second bus were both school buses. While the rest of the group was sent ahead to Saginaw, Heinrich -- along with staff member Mike Melnick and Corps Commander Bob Waskoviak -- were left behind to pack luggage onto the equipment truck. None of the corps members had put their names on the scattered white uniform shoes, Heinrich said as they were picking them up off the highway. All three men agreed that it could have been much worse if it weren't for the quick thinking of the truck driver Larry Noble of Clinton, Iowa. "It's a miracle it (the bus) stayed on the road," said Waskoviak. One corps member was pinned, he said, but he didn't know who it was. It would have been a lot worse if the bus had rolled into the ditch, he said. Waskoviak was driving the equipment truck and said he looked in his rear-view mirror and saw a big ball of fire. He said that quite a few truck drivers who were passing by helped put out the fire with hand extinguishers. Officials also said that conditions were foggy but Waskoviak said that the conditions were clear and became foggy by the time the police arrived. The coach bus was traveling at near-capacity. It was not known if either drivers will be charged. One of the corps members was admitted to LaGrange Hospital with multiple contusions and Noble was transferred from LaGrange to Parkview Memorial Hospital in Fort Wayne. Eight others were treated at LaGrange. Eighteen were treated and released from Cameron Memorial Hospital in Angola and seven were treated and released from Sturgis Hospital, according to hospital officials. Thanks to Robert Smith, soprano, for typing this article from his copy of the Sturgis Journal. Note from Rob: This is the story taken by the members after the shock had wore off. Just a little shock wore off! As far as the bus crash, I remember sitting next to Michelle Kincaid and a lot of us were just starting to doze off, when BOOM, everything jumped and jerked, it felt like we had been hit three different times......the one thing I remember is looking up front and seeing the smallest man you have ever seen, being the biggest hero of the day; he was literally standing up in the driver's seat trying to keep control of that bus......it was the most incredible thing I have ever seen....he is the one that kept most of us from being hurt further, he safely guided that big bus to a safe halt.....from that moment on I knew I could sleep on any bus he drove. It's been so long since I have even thought of the incident.......I know Kincaid, Roberts and myself will never forget.......but it brought a group of people who were already together even closer, I miss so many but forget the names and not the faces.......Drum Corps is either in your heart, or not in you at all!!! I sat in the middle seats of the bus, on the right side. It was pretty early in the morning, and most of us were sleeping. I can only remember hearing things, I didn't see a whole lot, for some reason. I remember waking up to a loud bang. And, all I heard was squealing tires, and one person (who will remain nameless) screaming Quade Funnicum's name. Quade and Jim Pecora were in the very back seat, next to the bathroom. Everyone that was injured was put onto the school bus to wait, as the more seriously injured people were checked on or taken to the hospital's first. I remember, very distinctly, how much the other corps members, not in the accident, were helping out. I'll never forget how calm and comforting Holly Franchino and John Kingsley were for the injured people, waiting to be checked out and taken to the hospital's. Later on, I found out that several corps members went back onto the "accident" bus, and were getting luggage and personal items off, and onto one of the other buses. And, I'll NEVER EVER forget how mad Larry Yunker was when he realized he ripped, and got blood on, his brand new peach colored sweater. Thanks to Terry Forrest, Larry was able to wear that same sweater later in the season. I think he STILL has that sweater. Larry ripped his sweater when he was thrown out of the bus window, into the ditch. He caught his back on the loops, for the rope, that run along the top of the windows. It seemed like we spent more than a day in those hospital's! And, we had to all pack onto a school bus and ride back home, to Saginaw. To this day, I can't figure out how Kevin Schussler slept, on that hot, smelly school bus. By the time we got back to Saginaw, he was fresh and ready to go. We pulled into Arthur Hill High School, on the night of our home show. And, the show had already started. I remember that Glassmen made a sign on a bed sheet, letting us know they were thinking about us, and wishing us well. Thinking back on drum corps, and the bus accident.........I never forget how everyone (members, staff and volunteers) helped one another, from comforting the injured, to getting all of the items off of the accident bus. It all comes down to the fact that everyone involved in any corps, anywhere, truly becomes ONE FAMILY.